The Noble M600 delivers the ultimate driver reward with a rush of adrenalin. We believe that many super car manufacturers place too much emphasis on driver assistance, which, in our view, negates driver reward. Rather than rely on electronic assistance our back to basics approach concentrates on the more analogue qualities of design. By utilising a principle of pure engineering integrity from the chassis up we ensure that the driving experience is an honest reflection of the drivers skill, putting you, the driver, back in control. Put simply, the Noble M600 is for those who love to drive. The M600 is meticulously hand-built in England and individually finished to the owners taste and aesthetic requirements. Exterior colour choice is only limited to the buyers imagination. For those wishing for something even more rare and individual we offer the M600 CarbonSport, featuring visible carbon weave which can be either lacquered natural weave or colour tinted. We believe that every Noble M600 should reflect both the personality and individuality of its owner. The M600 is primarily designed for speed and handling however this is not at the expense of either comfort or practicality. The cabin features a traditional bespoke British hand built finish, with your choice of leather, suede or Alcantara. Contrast or matching twin needle stitching. Exposed carbon centre console, door cards and gear knob, hand turned knobs and bezels and fine quality wool carpets bound to the edge with leather. The seats, designed and created exclusively for the M600, are of lightweight carbon fibre composite construction which can be bespoke upholstered to individual requirements. Seat backs can be natural exposed carbon or painted to match the exterior. Seat panels can be of any combination or colour. There are three variants of the Noble M600. The M600 Coupe, the M600 CarbonSport and the M600 Speedster. The Coupe is the original car as launched, and although all three cars are carbon the Coupe has a painted body. Running gear and performance are shared by all three models. The M600 Coupe, although painted, allows areas of the body to have exposed carbon areas and can be fully personalised to the clients taste. As with all our models it is fully bespoke and is offered with an unlimited colour palette for both interior and exterior. In many ways we were pioneers in the art of the fully exposed carbon body. After many exasperating experiments we finally perfected this finish. To make our lives a little harder we also offer a coloured carbon finish, this achieved by utilising specially formulated automotive 'inks' which are mixed with the finishing lacquer allowing the herringbone carbon weave to remain visible, giving a truly impressive and unique finish. As you can imagine perfecting a constant tint is a challenging and skilled feat. Carbon Fibre is in its natural state a fabric. It stretches, it moves and however carefully you, lay-up, you can never be sure that the weave will look perfect. Therefore, only the very best panels are utilised for the build of a CarbonSport. Although an incredibly time consuming task, the originality and rarity of this finish makes it almost unique in automotive finishing. We are sure that many will question our decision to remove the top of our M600. We are known for our driver reward purist approach to automotive engineering, so how does a roadster, many of which sacrifice handling and performance, fit our ethos? Due to our fixated approach to chassis design, taking the roof off has neither effected the handling nor indeed the weight of the M600. The carbon body on a M600 is not part of the integrity or the strength of the car, it is, rather like a Le Mans racing car, just clothing for the structure underneath. 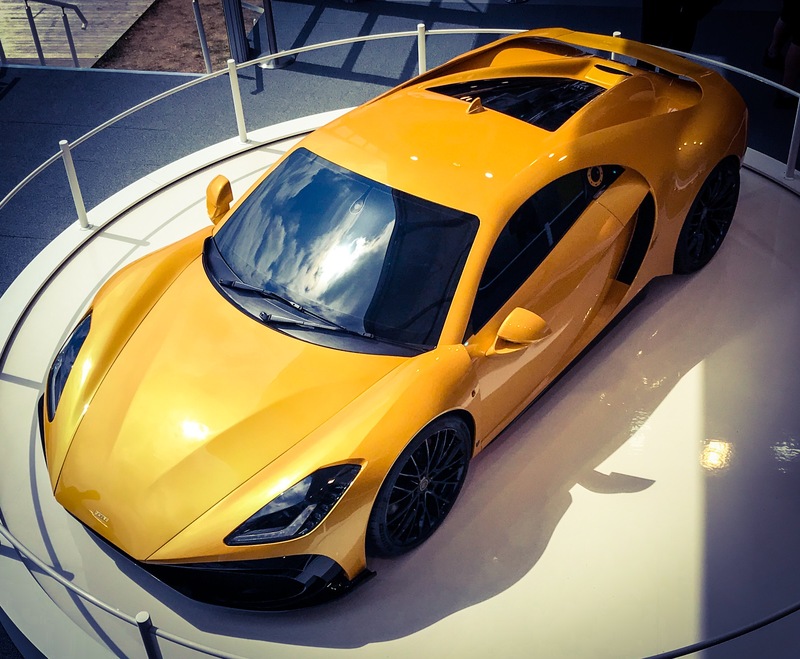 So the M600s incredible performance, apart from the aerodynamic effect when the roof is removed, is unaffected. Another question which we feel needs to be answered is - Why when Noble espouses the analogue approach to driving, do we feel it necessary to introduce a paddle shift system? Our personal preference is indeed a manual system, however we do understand that many supercar buyers prefer, for many reasons, a paddle shift system. However we did not think it apposite to totally abandon our driver reward visceral ethos. Therefore the paddle shift we employ is more similar in concept to a sequential system. An adaption of the Oerlikon Graziano gated manual six speed to an AMT clutch less hydraulically actuated gear change. Therefore it does not have the rather sedate automated twin clutch feel, but a more intense and dramatic sensation. One that we feel fits perfectly with our renowned driver focused ethos. This system will be available as an option on the M600 coupe as will the original manual on the M600 Speedster.